Pressed for time, having been away over the weekend, I was rapidly removing some of the final ingredients from the rickety metal cart and tossing them onto the moving belt up to the register at the Korean Market when she called. What? Already at my house? But we said 10:30, it was merely ten till ten. O.K. I confirmed I’d be there in ten. Minutes that was. Upon my arrival, we briefly hugged before getting to unload our bags of groceries, much of which we discovered then had double of. That got a giggle, before the bigger laugh came as I caught my breath and admitted to having factored in “Korean time” meaning she would arrive at least ten to fifteen minutes late, maybe later. She laughed at her determination in having scheduled our get-together for cooking some Korean food that day as being set for “American time,” arriving early. Dana Lee and I have known each other on and off for around 26 years, at least since two weeks after the arrival of my eldest daughter, Sooky the Stylist, from Korea. 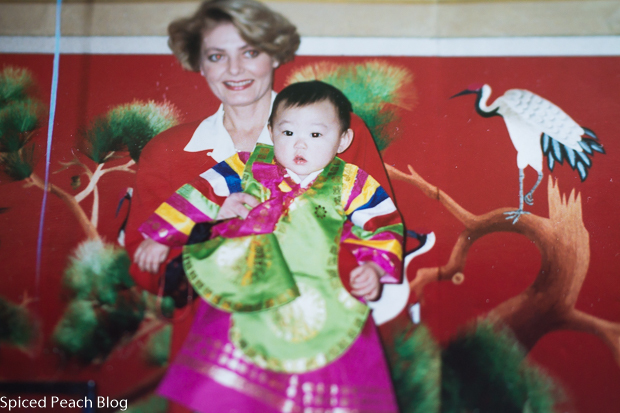 She worked at Shilla, the area Korean Barbecue Restaurant in northeast Philadelphia, a place first introduced to us by Jim and Eileen, adoptive parents whose youngest daughter, Jill, was also from Korea. Dana seemed our appointed person whenever our group frequented in to get our Bulgogi and Kim Chee fixes of which we had all become accustomed, and were eager to continue exposing to our children. We could always count on her to patiently explain any new dishes we might try on the menu, along with assisting on rapidly moving the grilling meat and vegetables with chopsticks across the hot metal tabletop griller whenever passing by. 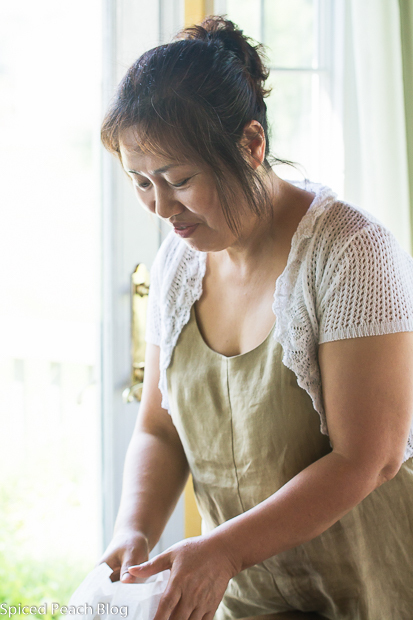 Mostly, she fussed affectionately over the children, and while they were still pint sized, always insisted on fixing their rice bowls, filling them all around with miso soup liquid and handing them spoons while instructing them in Korean to eat up. A few years later, around the time the little ones grew up a bit, having finished up all the contents of their rice bowls poured over with miso soup, they would end the meal entertaining themselves with the extra change we would bring for filling the metal coin slotted inserts beneath the clear glass globed mint and candy machines. Then again, with our friend, Jim Moran, we would pick up our newest bundle of joy at the New York airport, joining us from Korea, Alexandra Min Sun. Within the year, it was Dana Lee who then helped us prepare for her all-important Korean 1st birthday celebration held in a larger room above the restaurant. Around the time of Dana Lee moving on, we too moved residence to a suburb outside of Philadelphia, losing touch until a couple of years later, where again we would run into each other at the First Holy Communion of the daughter of our Korean neighbors, the Chang’s, across the street, and later then occasionally, at the Philadelphia area Korean market. And so it’s gone on this way for years, somehow we always continue to weave in and out of each other’s lives. Recently seeing each other again seemed a special reunion of sorts, so much to catch up on. Life being what it is, kind of like the Tofu dishes, starting out simply bland, before the marinating, fermenting, in the end creating a colorful, well flavored, beautiful dish. And so on our next encounter, we began our day’s journey of food preparations together, among the favorites of Dana Lee, Two Korean Tofu Dishes, Dubu-buchim, Chives & Dububuchim- yangnyeomjang. 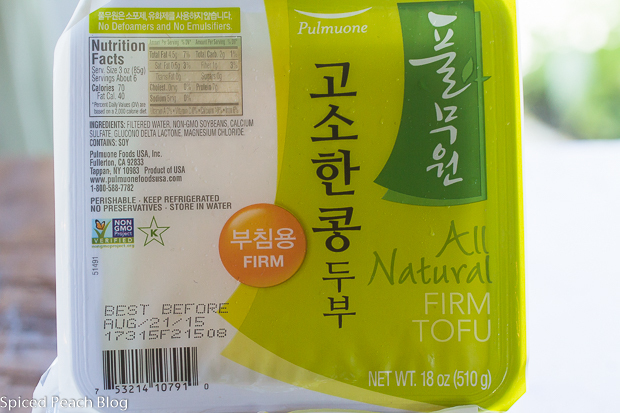 Both of the dishes begin with a package of this popular Korean brand of firm Tofu. Easy enough right? 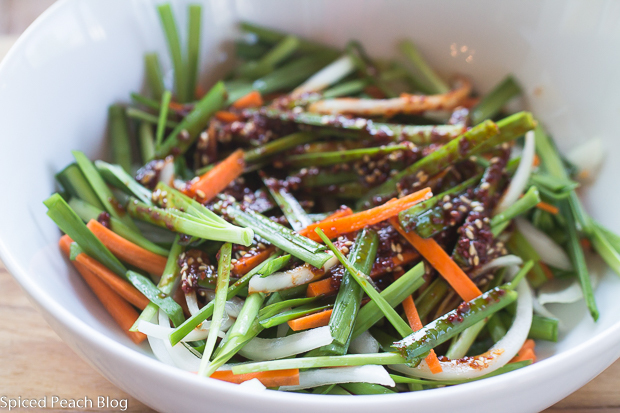 And to unravel the thought pattern to the ease of these dishes, one package will be sliced and fried slowly in oil on both sides until golden brown before topping with raw chopped Korean chives and vegetables in sauce. Another package of the tofu, using plastic gloves, will be mushed up in a bowl and combined with assorted sautéed vegetables, eggs, Korean pancake mix, and a bit of cheese before being shaped into pancakes for frying. The one thing they both have in common beginning the preparation: is always rinsing and drying the tofu from liquids using paper towels. You can see Dana drying the tofu in the photo above. 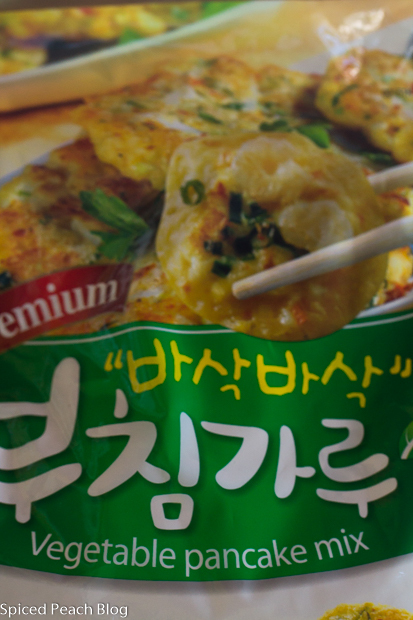 Above is a photo of a package of Korean vegetable pancake mix to give you an idea of what to look for when you go to the Asian market. There are a variety of brands to choose from. 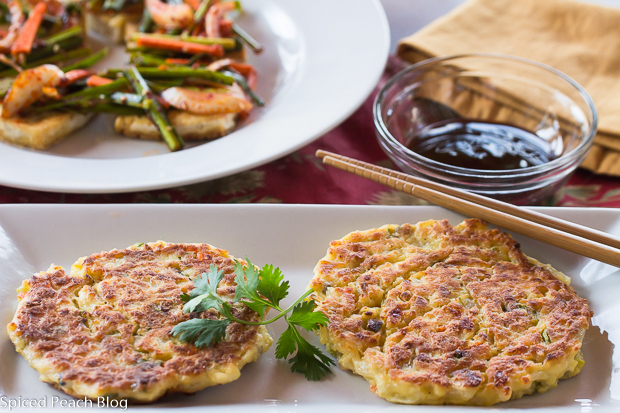 Always something new to learn, Dana uses the Bull-Dog Tonkatsu as the dipping sauce for the tofu pancakes, a sort of sweet lightly tart flavor. Interesting, as I would otherwise have simply prepared an easy soy sauce and rice vinegar dipping sauce. We actually prepared that later in our preparation of traditional Korean pancakes, but then there is another time to share that. Pour oil into a large nonstick pan and turn burner to low heat. 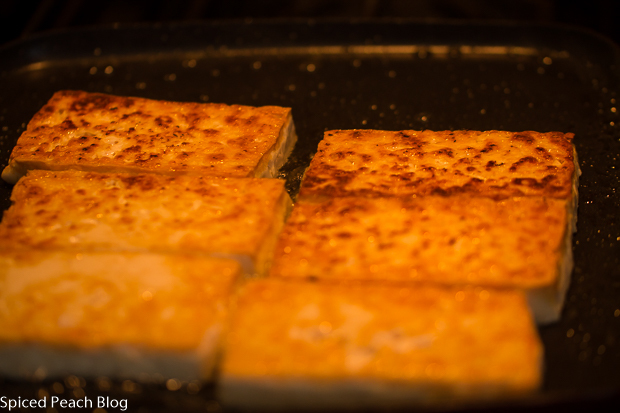 Place tofu slices evenly spaced in the pan and cook for around five minutes, or longer, until golden brown before flipping over and cooking until golden brown on the other side. Remove cooked tofu to a paper towel removing any excess grease then transfer to a platter and top with the raw vegetables mixed in the sauce. Remove about a quarter of the drained sliced onion to a mini food processor, add just a touch of water and wiz onion to a puree. Place pureed onion in a bowl along with the other sauce ingredients, stir well. 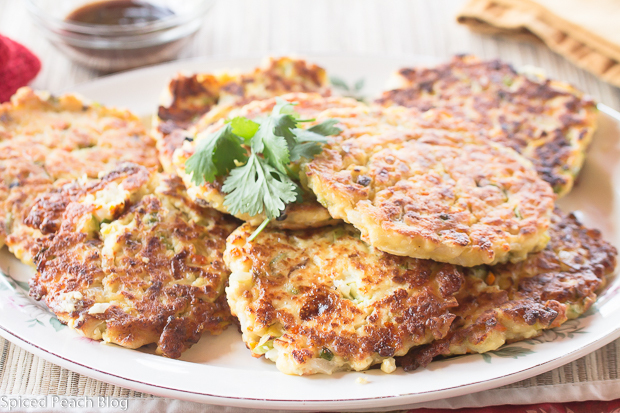 Fold in the Korean chives, carrot, and remaining onion slices, coating throughout. 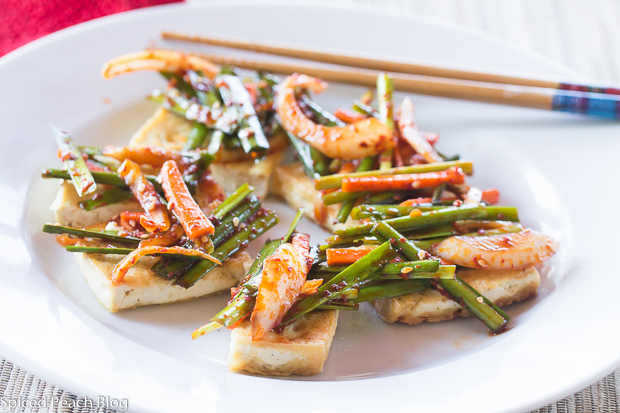 Arrange mixture decoratively over the fried tofu and serve. Add oil to a large nonstick pan on low heat. Tumble in the squash (or zucchini), onion, and carrot, cooking until softened, around two minutes, add in scallions and shiitake mushrooms cook another couple of minutes. Scrape in garlic, stir through, continuing to saute mixture a minute or two more, turn off heat, transfer vegetables to a bowl to cool. 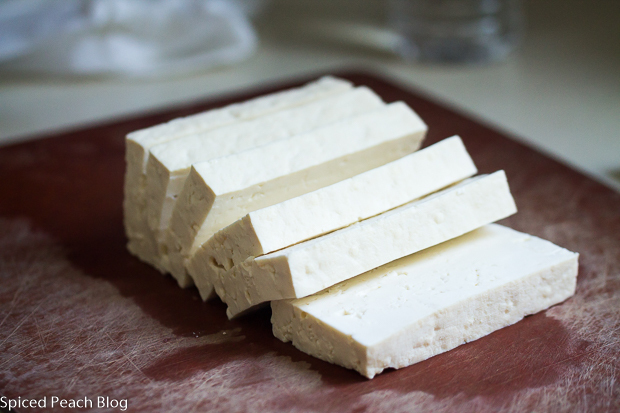 Rinse tofu and pat dry all around using paper towels. 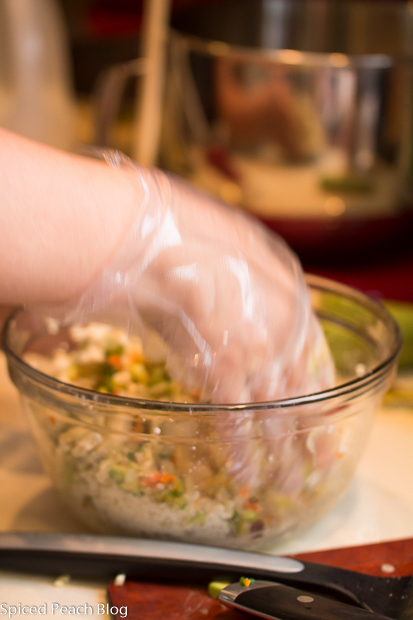 Place tofu into a large glass bowl, add in the salt and pepper then put on the disposable plastic gloves.Using hands, mush up the tofu until completely broken up. Add pancake batter to the beaten eggs and mix well, drop in the cheese, beat throughout then pour batter mixture into the mashed tofu and stir throughout to incorporate well. Add in the cooked vegetables, stir through. Batter should be just thick enough to shape a three inch round pancake, if too thin, add just a touch more Korean Pancake mix and stir through. Shape mixture into pancake shaped rounds. Heat a nonstick pancake pan, or large nonstick pan, on medium low, pour in oil, swirl about, then set pancakes onto pan, cook a couple minutes each side until golden brown. 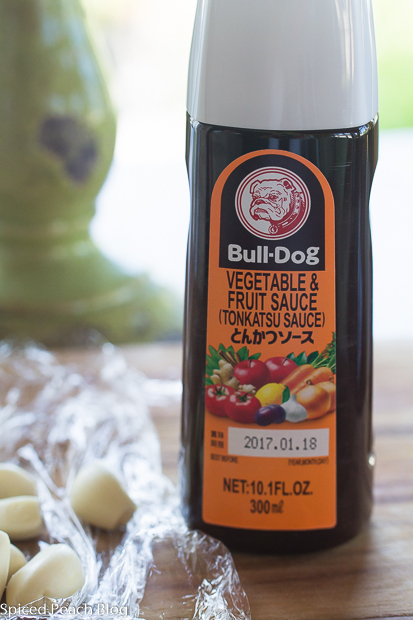 Serve alongside Bull Dog Tonkatsu, vegetable and fruit sauce. 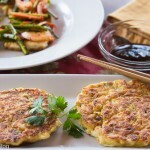 This entry was posted in Foods Around the World, Veggies and tagged Dubu-buchim, Dububuchim- yangnyeomjang, Korean style fried tofu with vegetables and sauce, Korean style Tofu Pancakes, Two Korean Tofu Dishes. Bookmark the permalink. Post a comment or leave a trackback: Trackback URL. 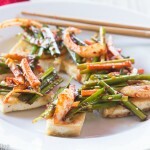 Hi Peggy, I love these two dishes, this is my kind of food with all the veggies. What a wonderful friend! Hi Cheri, Thanks so much and these dishes are delicious, though I am especially fond of the pancakes, yes, I am lucky to have known Dana over these years and appreciate her friendship! 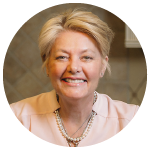 Dear Peggy, what a wonderful blog post about food and friendship so tightly interwoven and so lovingly presented! These recipes sound so utterly delicious, so fresh and so very flavorful – would love to try them some day!